Graces normally freeze to death while playing this early season fixture in leafy Essex. It was thankfully at least double digits this year requiring just the one long sleeve jumper. Due to a last minute dropout Yousuf made his debut and having lost the toss we were invited to bat on what was to prove a mainly true strip with the odd low bounce. Another great turn out of well wrapped up supporters watched as Jonners and Niroshan opened for Graces. The slow pace and accurate bowling led to a steady but low run rate until first change young Calver’s very first ball tempted Niroshan to pull a delivery which kept a bit low to bowl him for 14 – including 3 fours. Stuart in at 3 then was then trapped LBW by another low one from Calver for a duck 2 balls later. This took the total to 23 for 2 in the 11th over. Skipper Mahender took on the experienced loopy spinner , Battle , for a quick fire 17 until he slipped coming down the wicket and while still on his back unsuccessfully attempted to deflect the slowly passing ball away from his stumps and was bowled! Dominic in at 4 compiled a 52 run partnership with Jonners with some nicely timed shots before being bowled by 2nd change bowler Terry for a tidy 21. This took the score to 97 for 4 in the 26th over. Terry’s first over was remarkable as rustiness was shown with at least 8 wides! Jonners eventually perished 2 runs later for a resilient 30 in 26 overs- Newton at 6 showed nice application before being caught for 13 bringing together Manish and newbie Yousef for a 31 partnership before Manish was bowled for a tidy 21 . The score was now 130 for 6 with 10 overs still to bowl. Asad , in at 9 , then continued his cheeky running with Yousef compiling 29 very useful runs before Yousef was runout backing up for 10 – an encouraging first innings for Graces. Asad was caught for a rapid 20 and when Mamun was also caught for 4, leaving Matthew not out, we had reached 193 all out in 38.2 overs. This looked like a defendable total on this strip. Bizarrely extras were top score for us coming at an exceptionally high 42 – mainly wides – I have trouble recalling when this last happened. Graces enjoyed another fine tea in the host’s cute pavilion (the location for last year’s picture shoot) before taking the field. Newton and Mamun then bowled very tightly, the first wicket coming in the 13th over thanks to a great low catch by Asad. Manish and Asad then continued to keep the pressure on by bowling a very tight line keeping the scoring rate down. Asad bowled Sam, the young opener, for a stubborn 24 – 47 for 2 in the 16th over. The host’s batsmen could stay at the crease but were frustrated by our accurate bowling – Manish took the next 2 wickets before Yousuf took his first wicket for Graces! 80 for 5 in the 31st over with the run rate rising. Number 5 Rajiv then took on the bowlers with some well timed attacking shots in an entertaining 68 run partnership with Calver , the latter being eventually nicely stumped by Niroshan for 25. Loughton eventually ran out of overs finishing on 152 for 6 – a win by 41 runs. So another win for us with Manish winning man of the match for a great performance with bat and ball. Our ground fielding was good, backing up some accurate bowling which ,together with some good application by the batsmen, is encouraging for the coming season. Next week sees us at Greenford. Time to return to this Loughton ground in Essex but without attendant posse of cameras. We lost the toss and were put into bat. Immediately it was a struggle despite fine stroke play to get an over rate up and running as Dave Smith and Lloyd Mann took advantage of the low flat wicket. There are also some parts of the outfield where the ball dies rapidly, probably as a result of regular winter flooding but the groundsman is very capable and will do his best to provide for another 58 game events before end of season. Niroshan opened this week partnered by Jonners who was not out last week. Your scorer is working on recognition and did at least notice it was Jonners to face first ball. After 10 overs, the score had reached 23 and that included two fine boundaries from Niroshan. The bowling changed and student Seb Calver, a left handed, bowled Niroshan with a turn when unexpected. Stuart came in and went out after two balls as he was trapped LBW for a duck and it was up to Mahender to state intent with a boundary to avoid Wicket Maiden. The other new bowler was Andy Battle who like Jacobs of last week has a stealth bomb attack with high lobs that offer no mercy if they get through. After rapid boundaries Mahender thought he was going to crack a fine six, advanced far, the ball passedand a stumping was on the cards as he slipped on the turn but the ball itself carried on to rest just striking stumps, a useful 17 nonetheless. Dom was now in and both he and Jonners were defensive. After nearly an hour, in the 26th over 100 up was in sight and the 50 partnership just achieved when Andy still bowling got one through to collar Jonners LBW for a top score 30 in 88 minutes. Matthew Terry in the next over took Dom on 21 with a clean bowl as he sought to seek solace from some very loose deliveries which escalated the extras tally and still it was only 99 with 5 down. This left Newton and Manish in, both keen to get runs on the board and in three more overs they had got 31 before a fine catch at Long On by Dave Smith finished off Newton at 13 off the bowling of young Mathew Fulser who went to have a terrible following over. For our effort, it was the match debut of Yousuf who parried a lot of aggression. Manish meanwhile was stroking well and only came unstuck when Matt Terry got another ball Bang on but he had 21 and strike rate exceeding 100. As last week Asad was determined to play cavalier and was entertaining before Yousuf set charging off for a quick single on an Asad shot that was easily fielded and in consequence in scrambling back was run out in Lloyds return spell for an impressive 10. They had changed ends so strike did pass to Matthew who kept the Over alive. Dave Smith was also bowling a second spell and drew Asad to the clean hands of Billy Soomro at Midwicket but he had tallied 21. Now it was Mamun as last man after passed strike from a single of Matthew he claimed a boundary but then on another fine shot found Billy in the same region and clean hands to close the innings in the penultimate over and from such a low rate to start, a quite impressive 193 as our score. Extras were top scorer even passing Jonners but one of the points noticed in this innings was the fact that discounting those scoring below 4, all the others had found the defining line and Mahender had one that was probably only two yards short of being a six. For our opposition the best bowling at 4 – 2 – 11 – 2 was from Seb Calver who was in his debut match and had declined to bowl further as 7 available. Tea was of a high standard as usual here at Loughton and given the cool and curling breeze that chilled many, they had allowed us free access to hot drinks on self service. Nibbles throughout were kindly shared by Phil and support was ever present from Tom and James. 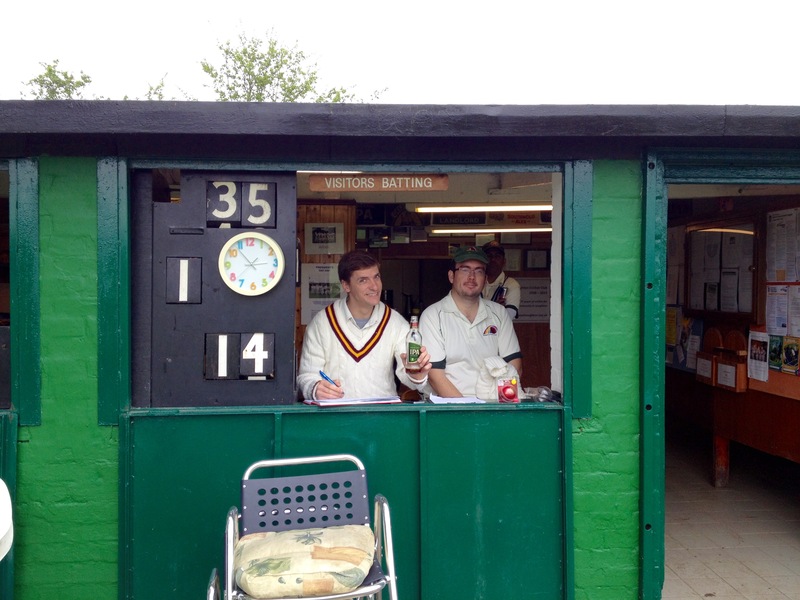 Scott and Sam also came along and Scott did a lengthy spell of umpiring with Stuart. Our other spectator was Biplob who enjoyed the game and was there to encourage Yousuf and I hope becomes one of our regular supporters. Newton and Mamun were our first bowlers in a day when each of the 7 had credible figures and they were facing Greg Jones and their wicketkeeper Sam Hill. Like our innings it was a solid plod to get runs and a lot of this was due to excellent close fielding and accurate returns for our part. It was not until the unlucky 13th over that Asad, whose run up was lesser this week, piled through the stumps of Sam who had amassed 24 of the meagre 37. Asad featured shortly after when the consistent bowling of Mamun drew Greg to Midwicket where Asad made sure for a low 16 having been at crease so long. Mamun finished the spell with wicket to all satisfaction only allowing 25. Another lean spell followed with Asad and Manish bowling very economically and the run rate was dire. Manish was spot on taking out Billy Soomro for 15 and Ahmed for 8 in his 6th and 7th overs. Asad went on to have 14-1 off 8 and Manish was at 8-2 in 7. Although Rajiv was expansive at the other end young Matthew was nervous and on his eighth attempt was bowled in the debut over of Yousuf, a lovely start. He was replaced by Seb who again seemed nervous but managed to punish Manish in his final over as did Rajiv and that bowling spell had suddenly climbed to 21-2 good though that is. Eight overs remaining and 101 required! Had they any late 20/20 resource? With the 9 lives of a cat and the definite fortune of a no ball denying Mahender a well grasped catch at cover as well as another catch potential also at a no ball, contentious definition, Seb went on for a fine 25 in a partnership with Rajiv of 68 before nicely stumped by Niroshan who had the gloves throughout with little getting past, that wicket bowled off Mahender. Dave Smith came in and got a boundary off one that was fumbled at field but it was all too late and their innings closed well short of the mark at 152. Rajiv unbowed at 41. Throughout this match, the bowling was credible, repetition! But it made it harder to choose Man of the Match with lots of competing claims. Mahender decided on Manish which we all delighted in when it was realised it was his first accolade in ten years of matches with us. Worthy for entertaining batting, always good field and sharp bowling. All credit to Jonners for another feat of endurance and top score and for lean bowling of Newton, 21 in 6 and Mahender 28-1 in 5 with Yousuf at 17-1 in 3 and Matthew 22 in 2 against that strike pair. Batsmen fared well in adversity. Two wins in two games, each with differing highlights. Next week we make one of limited appearances toward other end of Central line at Greenford to face Southlands. Jonners and Khin will no doubt be following our progress eight hours behind and Neil will be on Monday already. 2pm start unless Mahender advises otherwise.